The original Boeing 747 was so big that airports had to be adapted to accommodate it. Hangars were enlarged to fit the tail-fin, while tow-trucks and stairs on the taxiway had to be changed. The turbofan engines were more powerful and quieter than jet engines. There were 16 wheels – twice the normal - to spread the weight. Passengers in economy class had a greater sense of space because there were twin aisles and higher storage cabins. Travellers in first class had access to a cocktail bar up a spiral staircase. Pilots (two plus a flight engineer) had to be retrained in new simulators because the cockpit was so high off the ground. An object of boyish wonder, an aviation milestone, a sea-change for cheap air travel, a Jumbo of a plane, the Boeing 747 celebrates its 40th birthday. Four decades ago, Boeing's prototype 747 took to the skies over Washington State for a flight lasting some 75 minutes. The aircraft, named City of Everett after the location of the factory where it was manufactured, handled well. And so was born the aircraft which has become an icon of the aviation industry and helped bring cheap airline travel to millions of people. I remember as a small boy at the time, watching awestruck a BBC documentary about the development of the 747. The music used to convey the imposing size of the aircraft was Prokofiev's Dance of the Knights - familiar today from the opening sequence of the Apprentice. What then made the 747 unique was that it was the first "wide body" aircraft - it had more than one aisle. Today this is the norm for most long haul (and some short haul) aircraft. But at the time it was a big step towards reducing any sense of travelling in a narrow tube, and inducing a sense more equivalent to flying in a large room with high ceilings. Also new was the upper deck, accessed by a spiral staircase. When the aircraft entered service this was initially a rather exclusive bar for first class passengers - today it is more typically used as an additional business or economy class seating area. 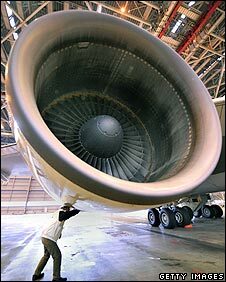 The 747 also saw the introduction of "big fan" engines, with an air intake large enough for a person to stand in. These engines were considerably more powerful than earlier generations, but in their early days did experience some problems with overheating. Airports had to adapt to the sheer size of the new plane once it entered service in 1970 with, for example, wider and stronger taxiways and new jetties (the walkways that connect with the plane). For airlines the big question was whether they would be able to fill the massive increase in seats, with a doubling of capacity compared with previous jet aircraft. There were times, particularly in the early 70s when the 747 did seem too big, as airlines struggled after the oil price shocks of the time. But over the years, airlines have been successful in attracting customers with most choosing a 3-class layout with around 350-400 seats. 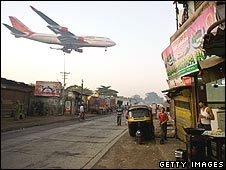 Against this growth the travel experience has arguably become less glamorous and more frustrating - just think of those times when several 747s arrive at once and disgorge all their passengers and baggage into the arrivals hall. This has been made possible by the economies of scale which a larger aircraft can offer. In simple terms the overall costs of operating an aircraft with, say 400 seats, are typically not double those of an aircraft with 200 seats. In effect, the cost per seat is reduced. On the one hand, the increased size of the 747 necessitated airlines offering lower fares to encourage more customers and on the other, it gave them the economic basis on which to do so profitably. So although we might complain of travelling in "cattle class" we have the 747 to thank for being able to do so at affordable prices. The 747 has also found a place in popular culture. It is one of the few modern aircraft to have made it into song - "I lost my heart on a 747" (Tom Paxton) and "got on board a westbound seven forty seven" is a line from "It never rains in southern California". This is an aircraft that has truly made its mark. John Strickland is an air industry consultant. The airlines ran joy rides on 747s when first delivered and in 69 or 70 my grandfather, being the oldest member and my grandmother were given a free trip courtesy of the local branch of the British Legion who did a group outing. As they were born in the 1890s and had never flown it was quite an experience. i have the Maidenhead Advertiser photograph. Hurrah for the 747. I have made several pilgrimages to stand at the end of the runway at Heathrow (which might sound a bit sad but I am a perfectly normal 33 year old woman who works in the media) and it has to be one of the most thrilling experiences you can possibly have when you see a jumbo coming in to land towards you and passing just metres above your head. It makes all the other planes (apart from the A380 of course) look a bit pathetic. Here's to the next 40 years. I can still vividly recall my first 'ride' on a 747 - as an 11-year-old. It was a bit of a disappointment. A flight on a 747 was something I had been eagerly hoping for since hearing of it years before. I was a bit of an airplane 'buff' so the excitement was like jet fuel running through my veins when I learned that my connection from Frankfurt to Manchester that time was going to be on a 'Jumbo' jet! The thrill of boarding such a giant and 'special' craft was almost immediately marred by the dinginess of the cabin - it felt crammed with a sea of people wedged into their seats by their possessions, stuffy with the stale air of old food and unwashed bodies and nerve jangling with the wailing of all those babies. Adding to the 'cruelty' of my disappointment I was wheeled indifferently by the stewardess into a seat behind the engines - who's continual roaring during the journey gave me a throbbing headache. I felt the glamour of flight ebbing with every mile the plane covered. Suffice it to say I was enormously pleased and relieved to be off the aircraft on arrival at 'Manchester International'. Being an 11-year old, though, my displeasure at how prosaic the flight had been was short lived. I was soon thrilling to the thought of another flight aboard a 747 - in the hope that next time would be 'better'. I had to wait 18 years for that though. The 707 also made it into a song - "In the early morning rain" by Gordon Lightfoot, sung by amongst others Peter, Paul & Mary. One of the more unlikely aspects of this success story is that the 747 was initially a stopgap product until long-haul air travel went supersonic. At least that was the generally accepted industry wisdom at the time. When that happened only with a handful of small Concordes, and when it became clear that mass air travel was the way forward, the stopgap 747, the unglamorous, unloved bird, mutated into a phenomenal cash cow. I flew the Boeing 747 series of airliners for a total of 17 years, and she is still the nicest flying, sturdy and reliable "Queen of the skies" that ever soared above the earth. I continue to fly and have flown many other airliners, but, still... nothing compares to the 747. This machine truly changed the world by making it much smaller for most of us. Long may the Boeing 747 continue in all its future variants! Well done. All that writing about that enormous plane, its talk of making flying available to the masses (read: a slightly larger section of the global rich), and no use of the word 'carbon' anywhere. I fly quite often and it never ceases to amaze me how the 747 is an amazing piece of engineering and true testimony to human achievement over the years. This majestic metal bird soars into the sky with what seems like uncanny ease and still today evokes the stomach tumbling excitement of a 40 something who feels like a little boy again. Long may she continue to rule the skiers. My first take off (in the 70s) on a 747 (Melbourne to Singapore) still stands out as one of my most exiting memories ever. Being pushed back against the back of my seat, you couldn't get the smile off my 6 year old face. Having now studied physics I have realised that for me it is not the speed of an aircraft that excites me but the amount of force needed to accelerate its mass down a runway to take off speed. And the fact that this is all coming from 4 glorified giant hairdryers. Wow! I remember BOAC moving from the VC10 to the Boing 747 to service the London to Hong Kong route. Back then the upper deck was an empty lounge and the first class seating below was relatively empty with the odd businessman or BOAC employee. As a child you got to visit the flight deck which I remember as great fun. And of course the journey time got cut significantly from what was something like 18 hours to around 14 as the plane still made regular stops at that time to pickup and drop off passengers along the way. Travel has changed significantly with many more passengers now! Bill Boeing to build the aircraft - he had a request from Juan Trippe of Pan American World Airways to co-operate and develop a lager jet aircraft to replace the Boeing 707 jetliner. It was a successful gamble for both companies and Pan Am ordered the first 25 aircraft. The rest is history to a degree. Trevor Lewis, Hampton Hill, England. My mother won a competition - I think with Pan Am, to fly LHR - NYC on their first flight from the UK back then. She turned it down though, thinking it was too dangerous for all those people on a plane, and it would never take-off (excuse the pun). She chose a flight to Edinburgh instead, and no disrespect to Edinburgh, regretted her decision ever since. It was another 35 years before she flew long-haul for the first time. 'This has been made possible by the economies of scale which a larger aircraft can offer' Really, Ryanair, EasyJet, Jet2, Southwest... none of the budget/cheap airlines use 747's. The sheer size of the thing means it costs more to land and longer to turn-around and needs more people to manage it when it's on the ground. All adds to cost.